Chess – the last 1,500 years is just the beginning! The traditional game of chess has remained relatively unchanged for 100s of years. Part of its enduring, almost romantic appeal lies in our ability to study games of the past, and marvel at the craftsmanship of antique boards and pieces. Often, even those that don’t understand the rules are still familiar with the structure of the game – opponents sitting each side of a square, 8×8 board, featuring pieces, pawns, etc. This being said, the game itself has undeniably become more technical in nature, with chess websites, engines, software, videos et al, all presenting the game from an upright, 2-dimensional, vertical perspective. In the digital age, the traditional skills of shaping wood, ivory, bone et al, have – to some degree – been replaced by high-tech crafts of graphics design, computer programming and media production. 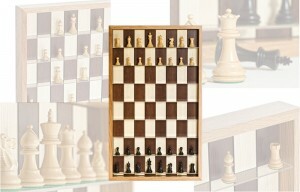 ChessTheGame.co.uk (CtG), an innovative chess business, has – with its vertical chess board – sought to combine the best of both worlds; offering, the tradition and beauty of hand-crafted chess boards, with modern, contemporary vertical presentation. Yes, that’s right – a vertical chessboard! In short, their ambitious goal is to challenge pre-conceived ideas of where, when and even how the game is played. The aspiration is to bring chess back into the forefront of our everyday living spaces, be they homes, offices, hotels, or coffee shops. The board, designed and built in collaboration with a master carpenter, features an oak frame, stained ash 8×8 board, and – to support the pieces – transparent acrylic shelves [80cm (H) x 48.1cm (W) x 6.8cm (D)]. It’s designed to be wall-mounted, just like a picture or photograph, with the traditional 8×8 squares becoming portrait-oriented oblong ‘cells’ [9cm (H) x 5.2cm (W) x 6.8cm (D)]. At present, ChessTheGame.co.uk retails this for £235 RRP, including a set of high quality, traditional Staunton style chess pieces. These sets are carved in finest Boxwood & Sheesham (Golden Rosewood), and come with four Queens; all pieces are double-weighted, with green-felt padded bases. These are beautifully crafted chess sets in their own right, and a perfect compliment to the vertical chessboard in which they reside. 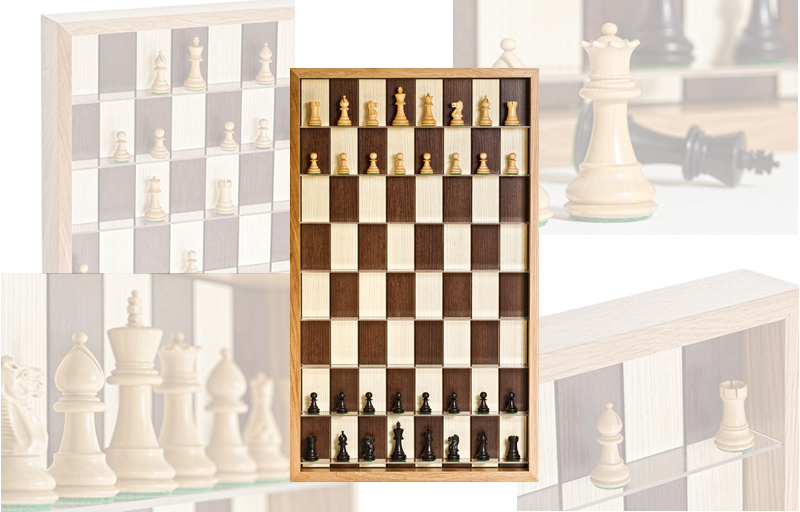 Of course, a vertical, wall-mounted chess set is undeniably more suited to turn-based, correspondence style chess, than frenetic 5-minute blitz. Other uses would include studying positions (e.g. problem solving), and displaying a prized chess set. For some, even those of us used to playing vertically on a PC screen, the portrait-orientated oblong board – will take some adjustment. This being said, there is an undeniable elegance to this product; the aesthetic design couple with its practical usage, means it verges on becoming ‘playable artwork’.